The Carbon steel shackle pin is replaced by a high strength, twice aged or precipitation hardened 17-4 Stainless steel instrumented shackle pin specifically engineered for each capacity to provide high accuracy and repeatability. The advanced microprocessor based wireless electronics and batteries are housed in a low profile, high strength, Delron enclosures sealed to IP65/NEMA 4x standards and are protected by a heavy duty Stainless Steel anti rotation bracket/guard assembly. 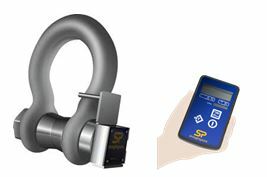 Requires SW-C The Wireless Hand held receiver allows full remote on/off of the loadcell, tare and peak hold functions, and also includes a programmable audible alarm. This provides high integrity, error free transmission of data via the latest in IEEE 802.15.4 (2.4 Ghz) technology and a proprietary transport protocol, and is unmatched in performance, capable of providing a license free transmission range of up to 800’. A full array of wireless accessories are also available including several user friendly windows based software packages.